The RAMPS (RepRap Arduino Mega Shield) is an all-in-one design to fit the necessary components for a 3D printer into one plug in shield for an Arduino MEGA. The plug in shield design includes plug in stepper drivers and extruder control electronics sockets for easy service, part replacement, upgrade-ability and expansion. We are providing an extensive series of Ramps 1.4 3d Printer Control Board, which are available in varied specifications that meet on client’s demand. The RAMPS (RepRap Arduino Mega Shield) is an all-in-one design to fit the necessary components for a 3D printer into one plug in shield for an Arduino MEGA. Feature: 3 Mosfets for heater / fan outputs and 3 thermistor circuits. 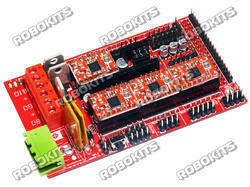 -MKS BASE is a feature rich all-in-one electronics solution for Reprap and other CNC devices. -It features an onboard ATmega2560. Its five motor outputs are powered by A4982 stepper drivers. - The board has In build sd card feature , SD slot adopts outer lead bonding, improving the stability of reading and writing.